In many ways, we are blessed. Our patients in and around Beachwood are as loyal as they come. We couldn’t be more thankful for that. For Dr. Hickle and the rest of us here at the office, these people are more than patients. They are familiar faces who brighten our day. One thing we’ve learned over the years is that they keep coming back because they love our office. That’s gratifying, because we’ve worked hard to create an environment people will feel comfortable in. But the question is, why do people love our office so much? What keeps them coming back? What sets us apart from others? Falling behind on the latest advancements in dental technology does a disservice to our patients. That’s why we pride ourselves on being a high-tech, progressive office with many of the most cutting edge technologies. 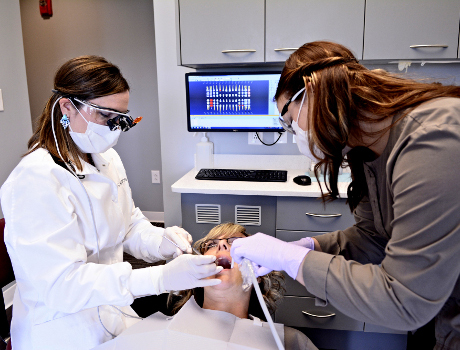 Our patients love the "Cerec" technology, which allows us to complete their needed work in just one day rather than multiple visits! We stay up to date on modern techniques to treat conditions like sleep apnea, migraines, and jaw pain, too, and we’ve also had great success with TENs therapy and Botox. Offering these diverse treatments had been a boon for our patients! Some dentists see no further than your teeth. Not Dr. Hickle and her staff. Our aim is to treat the whole person, not just the teeth. We get to know our patients. Their hopes, their fears, and what THEIR primary concerns are. This philosophy guides everything we do – and that’s priceless. No one likes trying to navigate the often baffling maze of insurance options. Thankfully, we are here to help. Our staff is well trained in dealing with the myriad of dental insurance companies. We look out for the best interest of our patients and help them understand what their plan covers (and in many cases, what it does not cover). Assistance like that gives them valuable peace of mind! It’s not enough for us to know your condition and the steps we’ll take to correct it. You have to understand, too. That’s why we take pride in educating our patients about their dental health conditions. If our patient doesn't fully understand their situation, we cannot help them help themselves back to a healthy state, so for us, education is paramount! Time and again, we’ve found that even patients who are otherwise hesitant to visit a dentist end up becoming regular patients in our office. We’re proud of that. We take pride in creating an atmosphere of healing, knowledge, and comfort. And that’s why our patients keep coming back. Interested? Give us a call or shoot us an email.